I often resort to serving crispy saltine crackers with soft brie (room temperature!) to guests. Brie and crackers are sophisticated, goes well with wine/beer and requires relatively no effort. Brie is a French style soft mold-ripened cow’s cheese with white ammonia tasting rind. It’s commonly sold in a wheel or wedge throughout the world, and has become increasingly common place cheese in the United States. Some people hate ammonia taste of its rind, which is due to ripening, but nearly everyone loves the soft and creamy cheese between the rinds. I love it so much that I often serve a significant portion of wheel to myself in lieu of popcorn during TV or movie watching. Usually, I don’t finish entire wheel of brie. However, once I remove brie from its parchment paper wrapping, it starts to harden soon. Often there is not so much left to concoct an entire recipe out of it. I have found the perfect use leftover brie in next morning’s omelet. 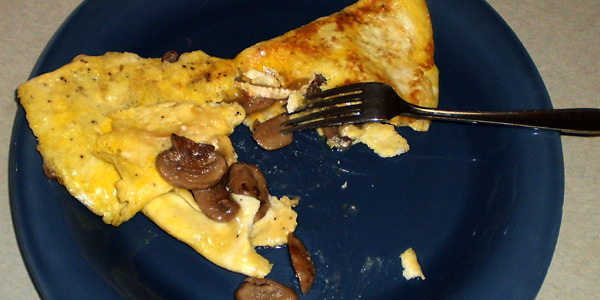 I often use another vegetable that goes bad easily in omelet, mushroom. It browns within a day after opening the pack. These two ingredients can indeed make sautéed mushroom brie omelet. 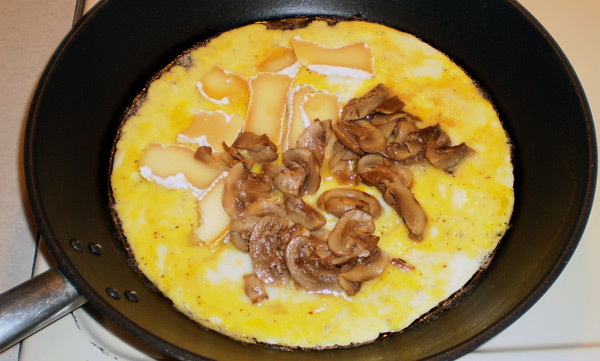 Both mushroom and brie are high in glutamate (the umami flavor) content an excellent choice for umami omelet. You can sautéed mushroom in the same pan you will make omelet. Here, I was impatient and decided to use microwave instead while I heat up omelet pan. 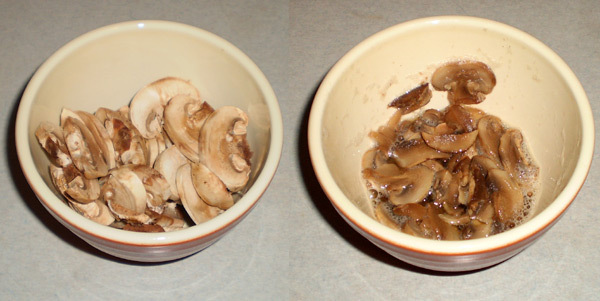 Coat sliced mushroom lightly with oil or melted and pop in the microwave for half to 1 minute. The microwave time depends on amount of mushroom, microwave type and amount of sautéing desired. Longer microwaving will result in dry (or crispier) mushrooms. Beat eggs lightly. Use fork for beating lightly, leave some viscosity (strength) or texture not completely frothy and runny. I usually like rustic lightly beaten eggs, which still have eggy consistency, instead of than frothy artificially tasting smoothly beaten eggs that you find in cafeteria. Also slice brie. Heat omelet pan, at a medium heat, for a few minutes. Grease up (butter up) pan and heat until grease is evenly distributed (slight wobbling of pan may be necessary). Heating pan for shorter time produces uneven heating of pan resulting uneven heating of omelet, seen as partial patchy browning (see results of my slight impatience in the final omelet picture). Thus, it is important to slowly and evenly heat the pan. As soon as you put the eggs, lower the heat to medium low. Within seconds, eggs will start to set, use a spatula to slowly scarping the eggs to the middle until the eggs are slightly runny. Add your toppings; sautéed mushroom and sliced brie. Fold the omelet in half and then slide out onto your plate. Turn off heat. Wait for few seconds and serve (or eat). Brie + mushrooms + eggs…you simply cannot go wrong. Looks delicious and would not have lasted 1 minute on my plate. @Heather, it hardly lasted on my plate, hence the picture of half eaten omelet. You are right, Gigi. Those were microwaved mushrooms..